Is the artifact connected to the village of Dar el-Tamyya? Well, yes, of course it's from the ancient Empire of Nithia. This is alluded to in the Player's Background text box (see below). And, yes, it's connected to the village. This is implied below, too (in the Player's Background). "Long ago in the wisdom of the Prophet, Al-Kalim, came to the village of Dar el-Tammya, and taught the folk to disregard their idols of old. But they kept one, to remember their ancient past and the wisdom of their ancestors. They also kept it because they believed it to be magical, blessed to protect the village from harm...."
"It [the idol/jade hare] goes back many centuries, to an ancient, forgotten empire that once ruled this land...."
Note that the Empire of Nithia's decline occurred in 500 BC (1,500 years before 1,000 AC, of course). And, the Empire's ascent began ~1,500 BC (according to GAZ 2), peaking in 1,000 BC. So that part of the DM Background information, above, matched with that of GAZ2. However, it's odd that the villagers have knowledge about the hare and some lore about Al-Kalim telling them not to worship ancient idols. Why do they remember all this? Shouldn't the bead of oblivion have obliterated all this from their memory, at the time of the demise of the Empire of Nithia? See below for some ideas I think could account for or be connected to this. I would definitely have given the artifact magical powers. Why else would Abu-Ghabar be after it? I don't think every valued treasure or relic has to be magical. it's nice to just have some item that has historical and or emotional value, sometimes. But, in this scenario, it's too tempting to not apply some magical powers here. The adventure also says, in the DM Background, that the warlock Abu-Ghabar "has long heard of its [the jade hare's] reputed (but unproven) powers, which he hopes to discover and turn to his own advantage...."
What would it take to activate the powers though? Do others have ideas for this module? "The earliest surviving ancient Egyptian amulets in the form of a hare... were typically made of carnelian and ivory." "The pairs of frog and serpent deities gave the city of Thoth its name, but it was the hare goddess, Wenet, whose name was given to that whole province of ancient Egypt, called a Nome, in which the city of Khemenu was located. The Nome of Wenet, the province of Hermopolis, was therefore "District of the Hare." Wenet was both the patron goddess of the area of Wenu, the 15th Upper Egyptian Nome and of the city of Thoth which is more commonly referred to as Hermopolis." Sometimes Osiris (called Un-nefer) was represented with the head of a hare, and was sacrificed to the Nile each year to facilitate the annual flooding which brought renewal of the land and crops. Un-nefer meant “The One Who Brings Good into Being" or "Beautiful Renewal." The hieroglyph "Wn" represented the very essence of life. The hare hieroglyph was an ideogram for the verb "to be", or "to exist". Further quotes (from the same mirrorofisis website article) -- "The hare was credited with powers of regeneration probably because of its well known fecundity. Its swiftness of movement and keenness of senses were seen as desirable defenses against forces of darkness." And, interestingly... "An amulet in the form of a hare amulet could be worn in life to endow its wearer with fertility, in death with the hope of rebirth, and both in life and in death for purposes of protection. " The RW city of Thoth was named after Thoth, who is the scribe of the gods (credited with the invention of writing by the Egyptians). Quote: " These two deities have some interesting similarities and are often paired in ancient Egyptian symbolism and art...."
The region where the village of Dar el-Tammya lies could be named after the idol, or named after the "idea" that the idol represents. The villagers may not know that the idol has a nomenclature, or if they do, may not realize that the region's designation is related to it, or that the region even had such a name in ancient times. There are a few different/fun ways to handle this. The region could be called sekhat (see here). 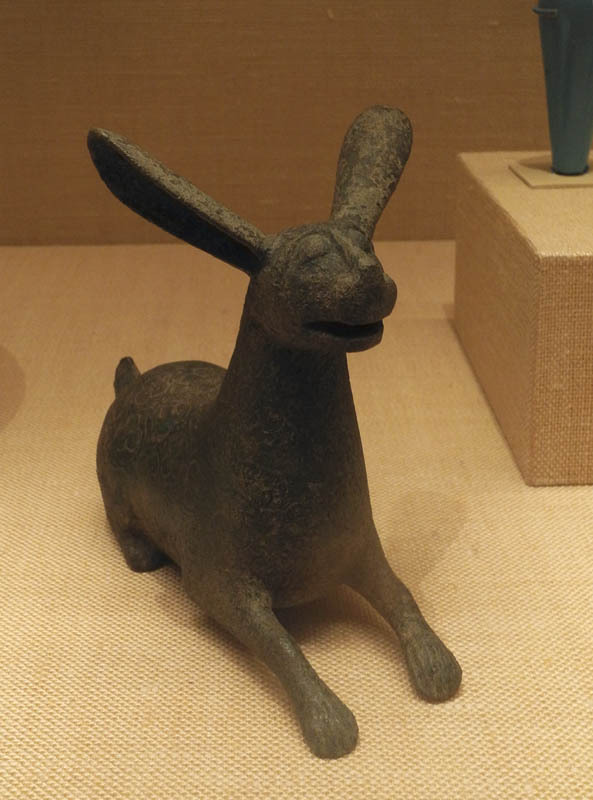 The jade hare could be the symbol of the ancient Nithian ruler of this region -- Wenet. And, the idol was created to protect the village. It would have some kind of protective powers, warding against enemies (creatures of chaotic or evil alignment, or somesuch). It is fairly powerful, with a broad radius over the area (2,000-foot radius?). It was created by clerics of one or more of the Immortal Guardians -- The Old Man of the Sea, Zephyr, or 'The Gnoll' (from GAZ2). Zephyr, representing wind, might be the best Immortal to use, since it relates to "swiftness." The hare represents swiftness and "existence" (or life in general). The people were taught (in this region) in ancient times to be observant and vigilant regarding the corrupting influence of evil Immortals and to be swift in running away from such influences. Of course, this did not happen. Thanatos corrupted the people of the area; they began worshiping him or his corrupting ways (and adopting necromancy), and there began to be clerics of Thanatos. The few existing clerics of Zephyr were killed, and a few (or one) of them took the jade hare and left. Why do the people have some knowledge about the hare, and that Al-Kalim warned against ancient idols? 1) I think that artifacts were not completely obliterated, in all of Ylaruam. The Empire of Nithia was removed, but not all traces. Some ruins with hieroglyphics still remain, presumably. Most likely in crypts/tombs. So, maybe there are some nearby tombs where the villagers (or their forebears) learned some things about the idol. But, how would they know how to read Nithian? Well, they could use the read languages spell. Additionally, there is an old caretaker in the village, from the module, who is the keeper of the idol (Abdullah). His forebears could have been instructed by scholars (mages, or whatever) in times past from nearby cities of Ylaruam (from which such learned sages might be more likely). And, this knowledge was carried down through a few generations. Al-Kalim himself might have instructed ancestors about the jade hare itself; he would, of course, had probably had SOME knowledge of Nithia from his many adventures. The hare might have been rediscovered in a nearby tomb a couple of centuries ago. Or, Al-Kalim might have located it and brought it back to the village. He might have done this around 835 ('838? AC); he told the villagers not to worship ancient idols, but may not have had a full idea of all the details (or the powers of the idol) that the villagers should have known; he knew just enough to bring the idol back to the village where it "belonged" (or at least decided to just tell them a certain amount of information). If we want to associate Thothia (on the Isle of Dawn) with Wenet' and the jade here, here are some ideas. Along with the idea of the RW Thoth being the god of writing, he would have been interesting in documenting and preserving things. Maybe the original Nithian settlers of the colony of Thothia took the jade hare with them, to protect it, and keep it from being corrupted or used for evil. Maybe that's the actual cultural leaning of the Thothians, whether deliberate and intentional or more subconcious -- they tend to like to preserve things, and pre-emptively, though subconsciously, knew that Nithia was susceptible to corruption, so they partially established Thothia in keeping with their inclinations to protect (themselves) and preserve (the order of things, culture, ward against corruption, etc.). Then, Al-Kalim may have obtained the idol from Thothia during "post-Emirates" adventuring career. Of course, at this time, the hare's protective powers are not currently active. So, some kind of scroll has to be found, to trigger the magical protective powers. The scroll would have some kind of ritual that would make the idol's powers active. The bad buy in the adventure (Abu-Ghabar) has not found out this information yet (let alone any existence of such a scroll). This is all I've got so far. Do these ramblings make a little sense? Would they help in finalizing some details (or adding more)?